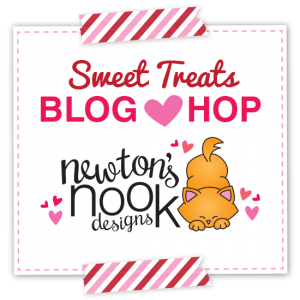 Newton’s Nook Designs 4th Annual Sweet Treats Blog Hop! 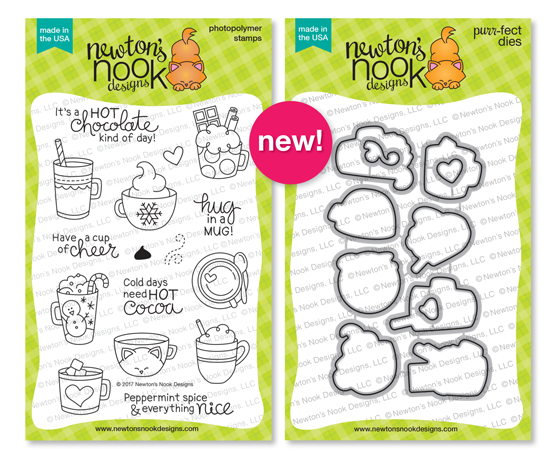 The Newton’s Nook Designs Team is hopping along today to share some great Sweet Treats – just in time for Valentine’s Day! Make sure you scroll down to the bottom of this post to see the whole list and hop along and comment for a chance to win! 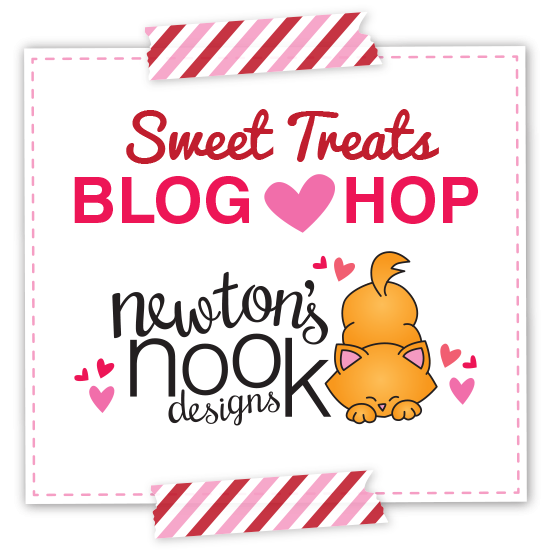 I am thrilled to be a part of this Sweet Treats Blog Hop today courtesy of Newton’s Nook Designs! 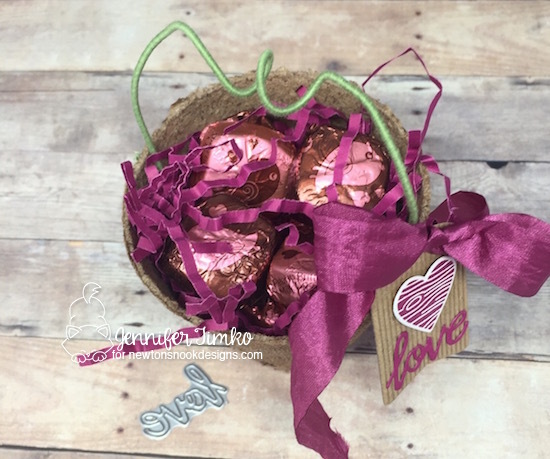 I love little treat ideas (and always seem to need one at the last minute!) so this is perfectly timed. 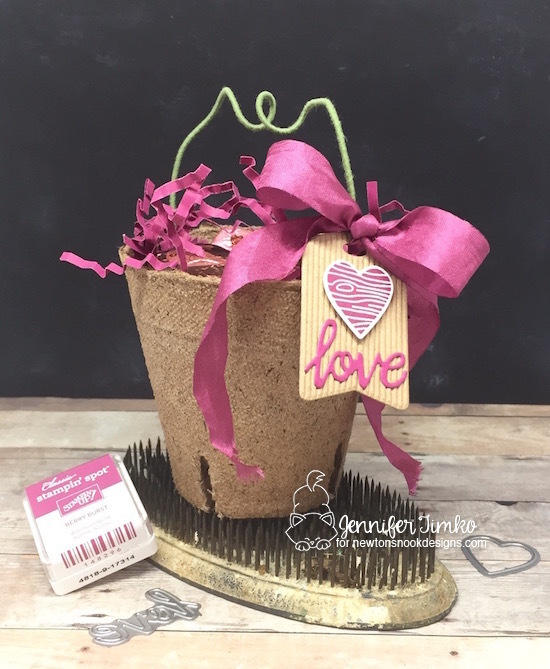 I have created little peat pot containers before but something about using them for Valentine’s Day seemed perfect for me this year. They are super economical so I just get a package and have them on hand. I used some floral wire to create a handle but you could totally go without one too. 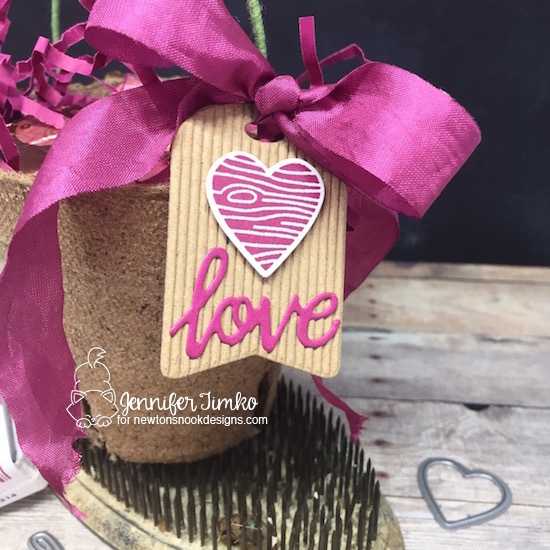 To create this cute little tag, I stamped the heart woodgrain heart from the Woodland Duos Stamp Set with Berry Burst ink (SU) and then cut it out with the coordinating Darling Hearts Dies. 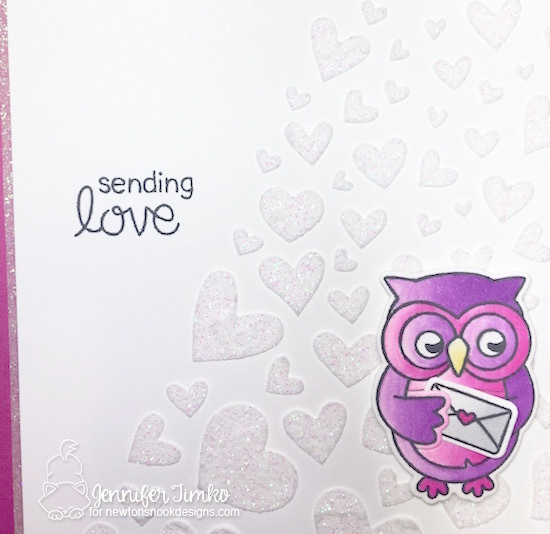 The “love” comes from the same die set and is so pretty in this berry pink. To keep it from being too “girly”, I used corrugated kraft paper for the tag. I like how it works with the peat pot too. I tied the tag onto the handle with some Berry Burst ribbon. 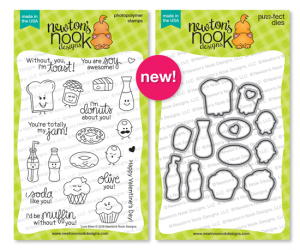 The joy of this….easy to do in an assembly line for a class or for friends and family! To fill, all I did was find some candy in a coordinating colors (yeah, I know, shopping with a paper swatch…I’m sure people thought I was a little off). These happen to be chocolate and peanut butter. I barely kept enough for my pictures before my boys were devouring them!! I added some of the berry shredded paper as a final touch. 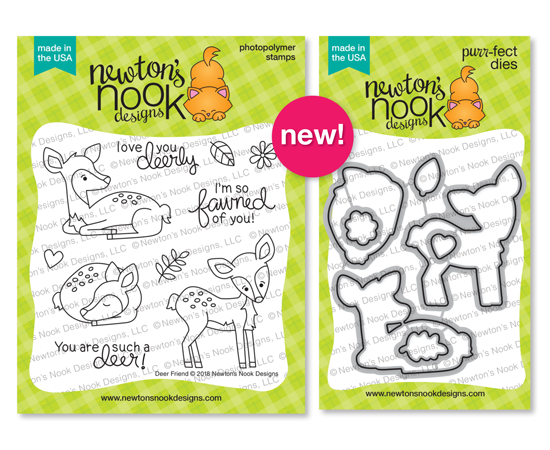 Welcome back for our last day of the January Release from Newton’s Nook Designs. I know you have been waiting to see him and here he is! 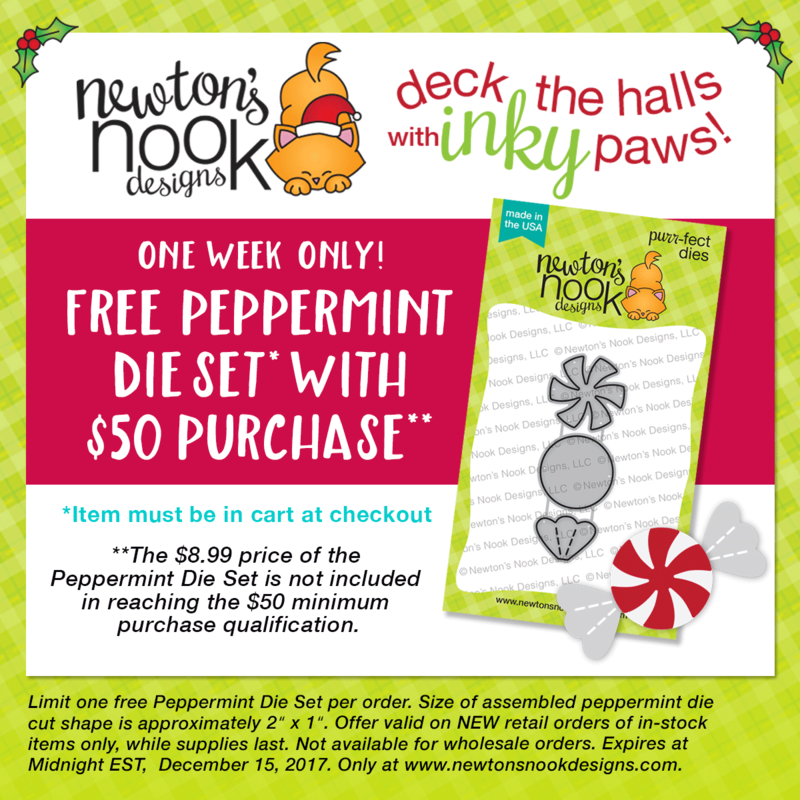 Newton! And his sweetheart!! Did you know he had one?? 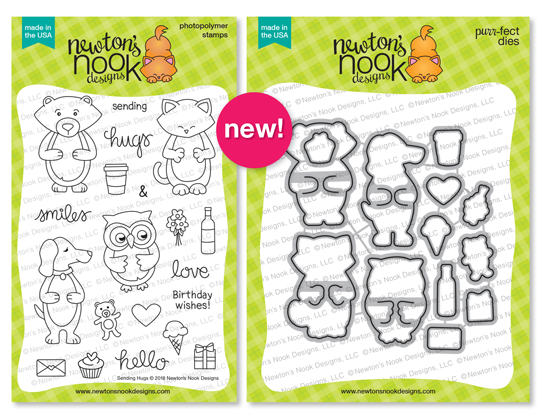 This Newton’s Sweetheart stamp set could not be cuter! 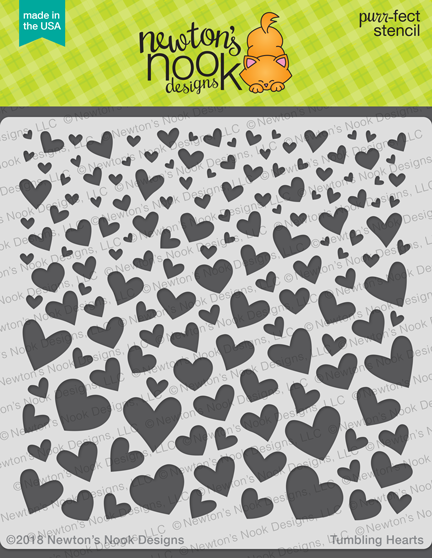 I love the sweet images and the wonderful sentiment choices too. When I asked if the sweetheart had a name, I was told no so I am officially petitioning to name her Kate. I might be biased. But let’s face it, orange tabby kitties are so cute when paired with little calico girls, aren’t they?? From the mom point of view, I love the idea of Kate finding a nice fellow from a good family who has a solid “in” with a company. When the company is named after him, all the better!! The long distance relationship might become an issue but we’ll get to that problem later, haha!! After I colored this cute pair using my Zig Clean Color Markers, I thought they might look great with some woodgrain and kraft texture behind them. I used two of the prints from the Wood Textures paper pack and then added a heart cut from Corrugate Kraft cut with the Darling Hearts die. I love this sentiment for Valentine’s but also for anniversaries! So another amazing release is revealed and the shopping starts tomorrow. But one more time, a chance to win!! 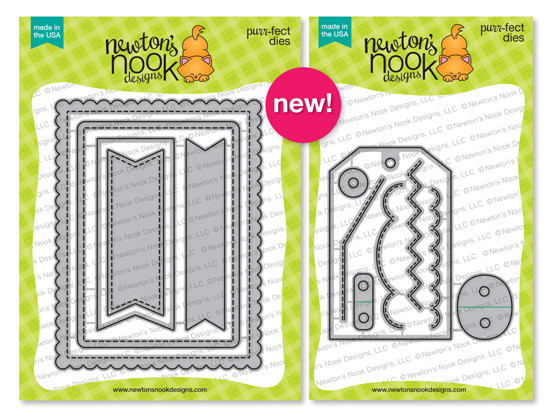 Welcome to day 1 of the January Release from Newton’s Nook Designs. Love is definitely in the air and you are going to enjoy this week’s fun and whimsical offerings! 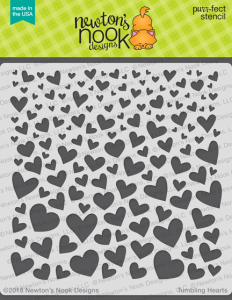 We are starting off today with a new stamp set called Love Bites and a stencil called Tumbling Hearts. 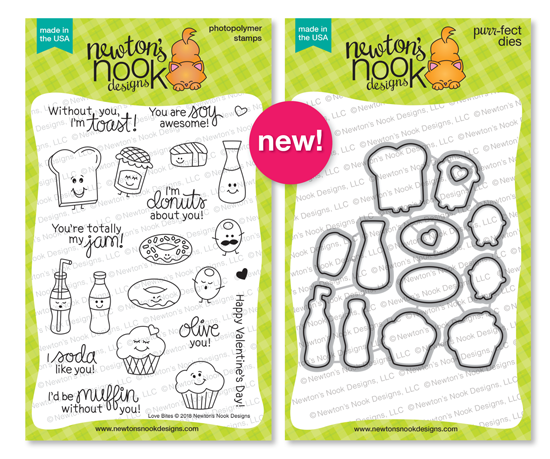 This adorable set features some creative pairings that you are sure to love! I’ll admit that the “totally my jam” sentiment called out to be used first. My youngest will often say that the radio is playing his jam when a favorite song comes on so this will be a perfect card for him. 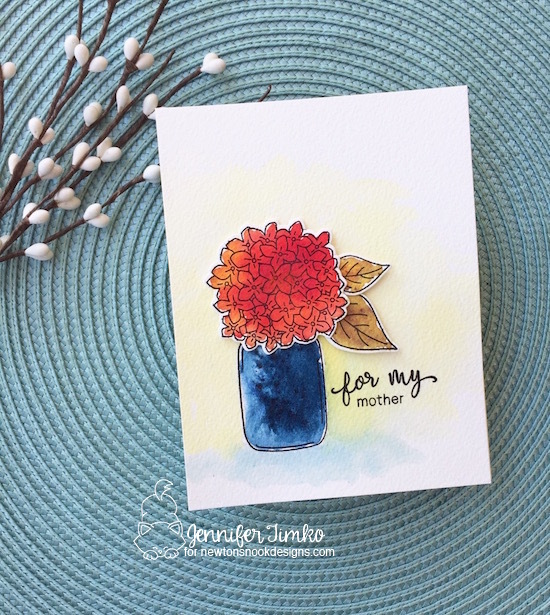 I stamped the images onto Bristol Smooth paper and colored using Tim Holtz Distress Inks. I thought this print (retired paper) was the perfect complement to the toast and allowed the jam to pop. 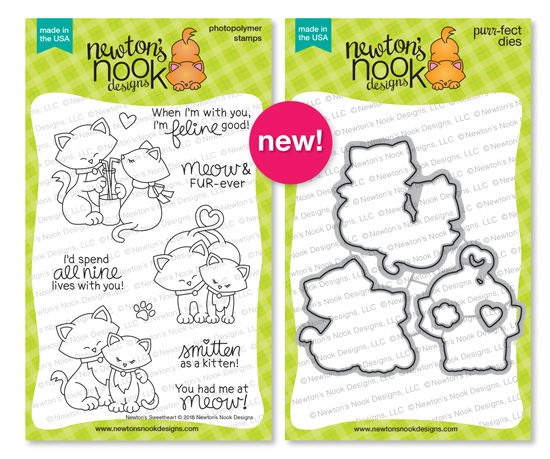 When a set is this cute, I think that is all you need to created a fun clean and special (CAS) card. I can’t wait to play with the other images in this set…good for Valentine’s but also for all year long. 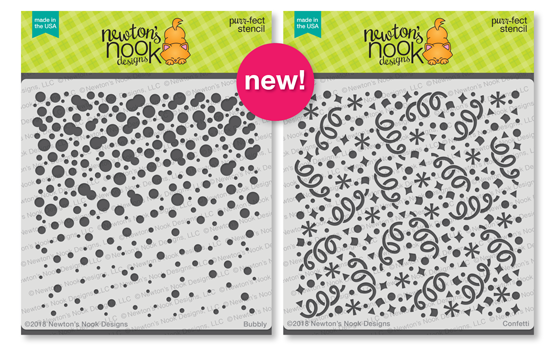 The new stencil is another must have for your repertoire. I will be showing it off later in the week but I’m sure the team has some examples to show you today. You can see it and all the images in the stamp set in the graphic below. Now on to everyone’s favorite part of release week. A chance to win!! 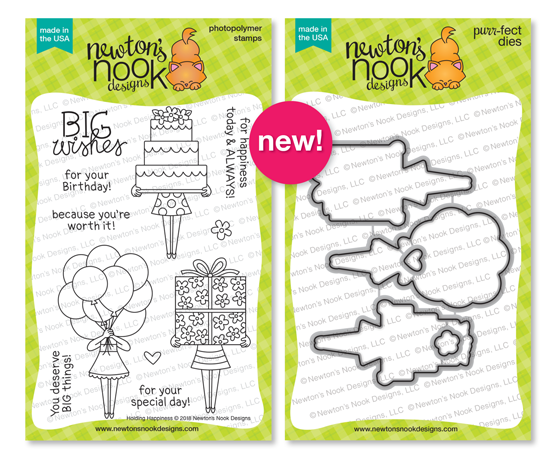 Today is my day to share a project on the Newton’s Nook Designs Blog. With all the cold we have been having, something about flowers is calling my name. So Lovely Blooms was a fun choice that I hadn’t used in a while. I recently got some Brusho Crystal Colours and this was a great time to give them a go. 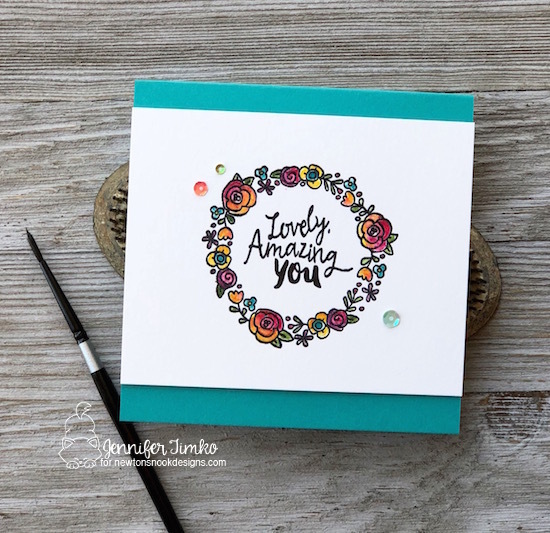 I played with all the colors in my 5 color pack (available from Stampin’ Up). On Arches Cold Press Watercolor Paper, I stamped the jar with Versafine Onyx Black Ink. I filled the jar with water using my paint brush and then sprinkled on the Prussian Blue Brusho. It is super cool to watch the color spread and move. I did the same with the flower and the leaves. The flower uses Gamboge, Brilliant Red and Yellow and the leaves use Moss Green and Yellow. Just put on the water and sprinkle…it is that easy. I had my 11 yo help on the leaves because he thought it was so interesting. Once everything was dry, I cut the flowers and the leaves with the coordinating dies. For the background wash, I sprinkled a little bit of powder into a palette and added water to create the paler version of the colors. I love that you can use this in multiple ways too. 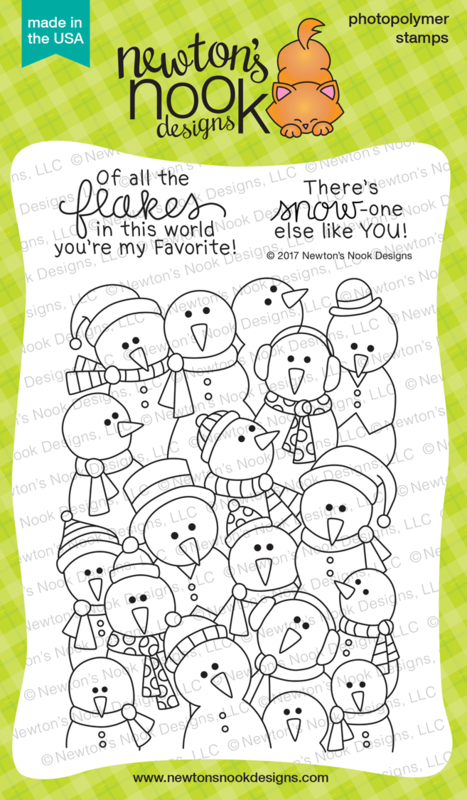 I pulled a sentiment from Simply Relative…such a must have set! You can’t see it from this picture but I actually attached the watercolor panel to a pale yellow card base for a sweet surprise when you open the card. I hope you enjoy this floral burst of color today! 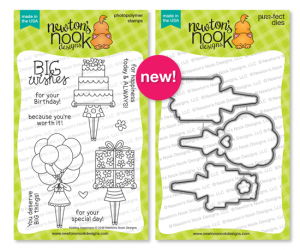 Make sure to stop by the Newton’s Nook Designs blog for daily inspiration. Thanks so much for stopping in and I’ll see you soon!